Traditional web application development often uses a separate programming language and templating engine. Templating engine is an area that usually causes a lot of pains for the developers. First, templating engines have not-so-user-friendly syntax. You will need to learn how to define placeholders, conditions and loops, often in a strange syntax. Second, templates are usually text based and error prone. Third, developers need to do a lot of context switch between the programs and templates, which is a burden that affects productivity. I can safely bet, the non-Star-Script version is probably a little longer and looks less concise. If you are a page author, you can now focus on what you do best – authoring the content; and leave the programming logic to the component developers. Hey, I am inside a colorful box. As you can see, the component developer and component users are separated. The component developer creates the function. They are the ones that need to have a lot of programming language knowledge. They need to know the concept of function, parameters, return values etc. The component user uses the tag called “colorful_box”. They need to be familiar with the basic markup language syntax. They need to know the tag name. They need to know that the new tag takes an attribute called “color”. That’s it. They don’t have to worry about function, parameters, programming etc. For them, it is declarative programming. Isn’t it neat? The colorful_box example is quite trivial. It mainly shows you that you can wrap a piece of html snippet in a function and re-use it as tags somewhere else. Star Script strongly encourage code re-use and re-usable cmoponent based programming. task 2: create placeholders in your HTML and fill it with desired content. How about seperation of concern? You may ask. Should we seperate presentation logic from business logic? I think yes. Seperation of concern is good programming practice. It is enabled in Star Script but not enforced. Just like seperation between component developer and component user, it is a logical seperation. There is nothing prevent you from both writing tag function and using tag in your code. 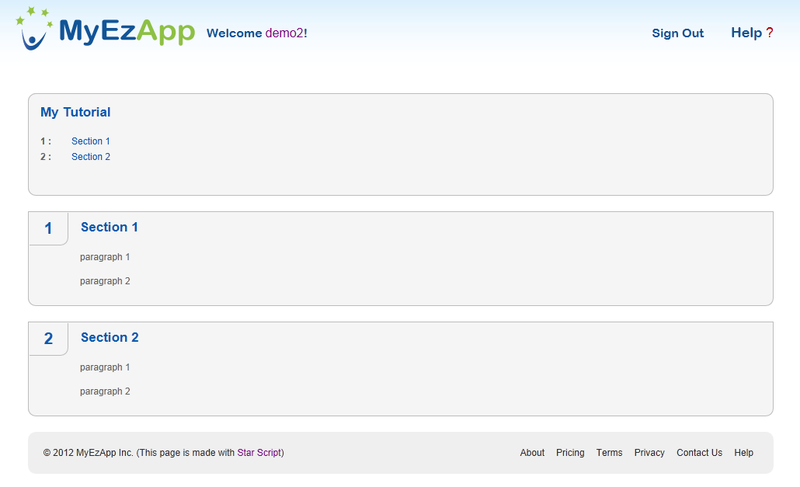 As a reference, there are many sample applications on MyEzApp.com which you can install with source code. Many of them follow strict MVC pattern. Now, before you try it out, you may be interested in the performance and reliability of Star Script. Behind the scene, Star Script works similar to JSP. It generates static Java source code and compiles it into Java classes. At runtime, the JVM only loads the script class once. On every request, a script object is created, which holds the state of the script. When request is completed, the script object is garbage collected by the JVM. Therefore, Star Script has similar performance and reliability characteristic as JSP. At the high level, it means, first time when you run a script, you will need to pay for the compilation which can take 100 milliseconds per script on an avarage machine. Once the script is compiled, it is running at close to Java native speed. Star Script can be used to develop sophisticated web site. Every page on the MyEzApp.com is written in Star Script. If you are not quite sure that you will use Star Script for your dynamic web application. 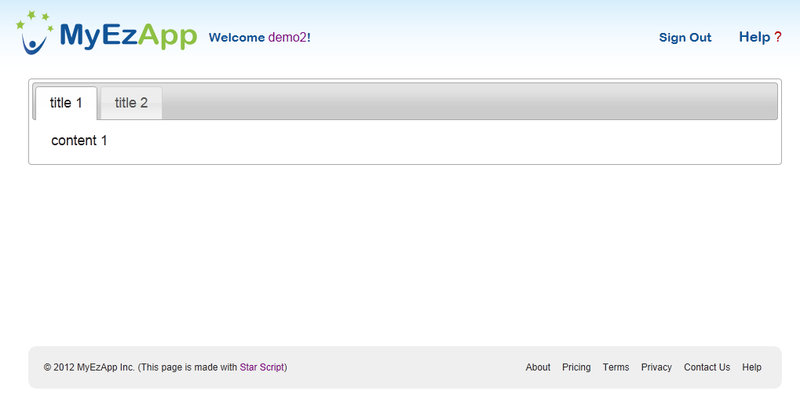 You can use Star Script offline to manage your static html pages such as the tutorial pages. Wouldn’t it be nice if you can write your tutorials like the below? I use the term “offline” because you can write the output of Star Script program into a file using the “-out” parameter. This way, you can manage your content source in Star Script and generate the static html files at build time. Star Script has a lot of other features, such as built in database function, native functions, etc. I will discuss more in the future. Interested in trying it out? You can download the Star Script compiler free from http://www.starsrc.org. Or you can try it out online at MyEzApp.com. Thanks for reading! Please feel free to drop me a line if you have any comments.